The planet Saturn will be moving back to the sign Scorpio on June 21, 2017 (IST). He will stay in this sign until August 24, 2017 in retrograde motion. Then he will turn direct in this sign and will stay until October 26, 2017. During his stay in Scorpio, his inimical sign, Saturn will be transiting the star Jyeshta, the friendly star of the planet. So you can expect a mixed result from the karmic planet during his abode in this sign. During the 65-day period of retrograde motion and 62 days of direct, you can expect more transformations, new inventions in medicine, and political changes. This is the period to learn patience and perseverance. This is the period where you can reap maximum spiritual growth and move towards enlightenment, participating in philanthropic work or work for oppressed people. This is the best period to revisit missed opportunities. This is a period where Saturn can show you the reality of life. You need to be watchful about sarcastic speech, rash and impulsive nature. It is better to avoid making any hasty decision or think carefully before taking any major life changing decision. During the retrograde period from Sagittarius to Scorpio, Saturn will be transiting backwards from Moola star to Jyeshta star in Scorpio which is known as Ganadanta point in Vedic astrology. The last pada in watery sign and first pada in fiery sign, called Ganadanta, is considered bad for the planets as the planets are not comfortable while transiting from watery to fiery sign. However, some good effects are also seen in this point as planets like Ketu and Saturn might bring spiritual and mystical experiences. Click on the time frame listed below to navigate to the Saturn Transit Predictions 2017 for your Moon Sign. Saturn Retro in Scorpio is the best period to revisit the missed opportunities. This is a period where Saturn can show you the reality of life. You need to be watchful about sarcastic speech, rash and impulsive nature. It is better to avoid making any hasty decision or think carefully before taking any major life changing decision. Participating in the remedy rituals can pacify Saturn and cross the period smoothly. Please Note: Your prasad will be shipped from Chennai, Tamil Nadu, after the entire set of 11 Monday rituals are performed. For international shipping, please allow 2 – 4 weeks for delivery. You will start witnessing the effects of Saturn Transit 2 months before the actual transit happens. Lord Ayyappa, born out of the spiritual union of Lord Vishnu and Shiva, has unique powers to control the bad effects of Saturn. 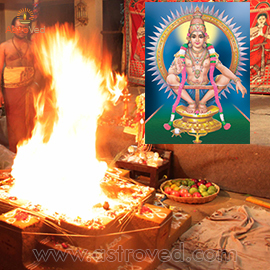 This special connection between Lord Ayyappa and Saturn is the basis for our special offer of an individual fire lab to Lord Ayyappa for people undergoing hardships due to Sade Sati (7 and half period of Saturn), 8th house Saturn, 4th house Saturn and Saturn Dosha (Saturn Affliction), to reduce the impact of Saturn. The timing of the homa will be customized for you upon analyzing the impact of this Saturn transit in your birth chart. Order your individual Ayyappa Homa (Fire Lab) to invoke the protective shield of Lord Ayyappa, whose blessings can control the malefic effects of Saturn. One of the most important transits in 2017 is the transit of Saturn into Sagittarius. Your birth chart and blessing are unique and this personal Live Astrology Consultation (LAC) with our expert astrologer can help you understand how this period of Saturn will impact your different areas of life. You will be provided with specific details of what to expect and suggested ways to lessen the impact and make the best of the favorable energies. The energized Horse Shoe is known as an effective remedy for those experiencing the unfavorable influence of Saturn in one’s birth chart. It can benefit you, especially if you are undergoing Sade Sati, which is the 7 and ½ year period of Saturn, or Ashtama Shani, when Saturn is in the 8th house from one’s Moon sign, or Sani Dasa, which is the major period of Saturn, or Sani Bhukti, which is the minor period of Saturn. Horse Shoe works on the spiritual principle that any object acquires the consciousness of its owner, when used for a long duration of time. This Horse Shoe, when fixed on the main door of the house as an upturned arch, is said to have the power to absorb the negativity and dissolve any bad fortune which a person may be experiencing due to Saturn’s adverse impact. You will receive the sacred Vibhuti and kum-kum (Red Vermillion Powder), which will be blessed in the rituals. Keep this on your meditation altar and wear it on your forehead during meditation or at other times to expand the Divine blessings into your life. On your behalf, a proxy person will write the mantra 1008 times which invokes the energy of planet Saturn (Sani). 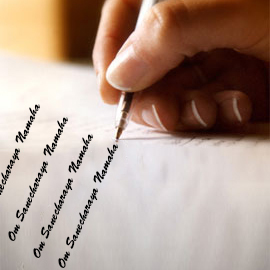 Writing mantras involves focus, and the constant repetition is known to transform the sponsor’s consciousness. The sponsor receives the good merit of supporting the livelihood of proxy mantra writers. HOW WILL SATURN BENEFIT YOU IN 2017-2020? Aries The transit in the 9th house from your native Moon has great potential to positively impact your wealth and overall prosperity, as that house signifies general luck and good fortune. Taurus The transit in the 8th house from your native Moon can help you enjoy inheritance, spousal income and pleasure, sudden wealth, longevity and metaphysical affairs. Gemini The transit in the 7th house from your native Moon may prove lucky for business partnerships and professional efforts and bring positive changes to your money, relationships and spouse. Leo The transit in the 5th house from your native Moon could bring you the warmth and support of loving relationships and prosperity in terms of wealth, business prospects and professional growth. Virgo The transit in the 4th house from your native Moon can help you with repayment of loans, winning over enemies, career growth after hard work, recovery from illness and to be more organized in your professional life. Libra The transit in the 3rd house from your native Moon could give fortunes, abundant gain of wealth, sound health, heroic victory over enemies, happiness, and overall, a Midas touch. Scorpio The transit in the 2nd house from your native moon could bring you wealth and prosperity, gold and gems, profits through lands, gain of houses and vehicular comforts. Sagittarius The transit in your house of native moon is said to possibly load and enrich you with money and riches. You could overcome the roadblocks and delays in your career. Capricorn The transit in the 12th house from your native Moon signifies bed comforts and expenses, frequent travels, diverse expenditures, pilgrimages and abundant sensual pleasures. Aquarius The transit in the 11th house from your native Moon is a most advantageous transit by all ancient accounts. Many blessings could shower on you- lots of happiness, gains and honor can be expected. Pisces The transit in the 10th house from your native Moon representing career, income, honor, and karma, may bring you exactly the kind of prosperity you have been working hard for over the past few years.